As promised, here is my review of a book that I wanted to like but didn't, as it appeared in the Globe & Mail on Easter weekend 2013. Saleema Nawaz burst onto the Canadian literary scene in 2008 with Mother Superior, a widely praised collection of short stories. “My Three Girls,” a story from the collection, won the Journey Prize, while several other stories were published in established literary journals across the country. Bone & Bread, Nawaz’s first full-length novel, is based on the characters in “Bloodlines,” also a story in Mother Superior. In Bone & Bread, Beena and her younger sister Sadhana live in a tiny apartment above a bagel store in Montreal’s Mile End. Their father, Vishram Singh, the bagel shop owner, dies suddenly, leaving the business to his younger and more traditional Sikh brother, Harinder. The Singh family in India had disowned their eldest son because of his marriage to a white American woman, Beena and Sadhana’s mother, in spite of her conversion to Sikhism. After the father’s death, their apartment is set ablaze by neo-Nazis, and Sadhana soon shows signs of obsessive compulsive disorder. Tragedy strikes again when the mother dies, leaving the two young teens in the care of Harinder, the girls’ only living relative in Canada. Within a year, Sadhana is hospitalized for anorexia, an illness she battles her whole short life, while Beena finds herself pregnant. The child’s father, Ravi, a bagel shop employee, is nowhere to be found. Beena tells their story from the present as an adult living in Ottawa with her now 18-year-old son Quinn. Sadhana, the actress, dancer and political activist, has died, and Beena must return to Montreal and empty her apartment. In the process, she uncovers evidence that raises suspicions about the circumstances surrounding her sister’s death. She also discovers that Sadhana had secretly contacted Ravi, a rising right-wing political star. Bone & Bread is ambitious with easily enough material for two novels. Nawaz successfully portrays a strong yet tumultuous bond between the two sisters, and the author is equally adept at showing the extreme demands of caring for a loved one with anorexia. However, the economy of words and razor-sharp prose of Mother Superior are not to be found in this novel. Instead, there is effusive detail that adds little depth to the story and does not advance the plot. “She sent us an invitation in the mail, on crisp, cream-coloured cardstock, neatly handwritten in feathery script she could only produce with her fountain pen. Turquoise ink,” writes Nawaz of Sadhana’s preparations for a party that would serve merely to contrast the two sisters’ lifestyles. Most sentences are as heavily wrought. Then there is the issue of the baffling similes and metaphors, leaving the reader momentarily distracted by what exactly is being evoked, “regret has simply become the shadow I would cast if I stood in the sun.” These distractions are unwelcome, especially when the storyline is confusing. With the narrative switching often from the backstory to Beena in the present reminiscing about the past, the novel needs all the coherence it can muster. However, even these problems might have been overlooked if the author had chosen to show rather than tell so much of the story. The result is language that prevents the reader from experiencing the action first hand. Nawaz writes, “I sat back, watching Sadhana animate the conversation, expounding in her desultory way to Quinn, drawing him out, taking obvious pleasure, as she always did, in his quick mind, his willingness to listen.” Something as simple as dialogue might have made this scene clearer and more accessible to the reader. While I was not immediately aware of the problems in Bread & Bone, I eventually realized that I was putting the book down every few pages to catch my breath and make better sense of it. Unfortunately, not everyone will be able to pick it up again. 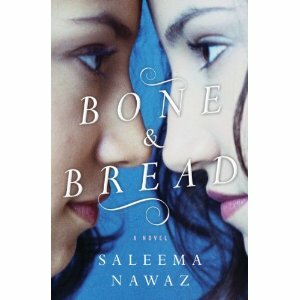 : Bone and Bread by Saleema NawazTweet this!